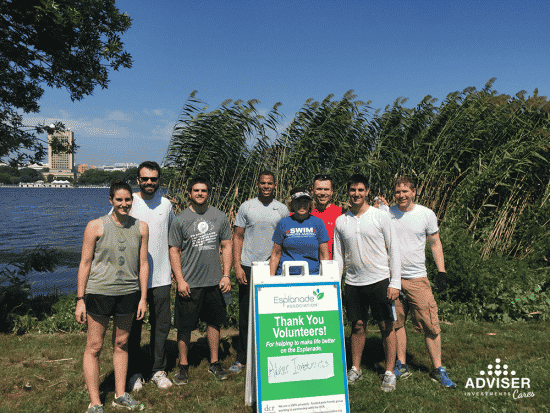 This dedicated group of Adviser Investments’ volunteers recently braved Boston’s scorching summer heat to help The Esplanade Association’s beautification efforts along Boston’s Charles River. The Esplanade Association is the only 100% privately funded non-profit organization dedicated to this highly trafficked public space. Since its 2001 founding, this organization has committed its efforts to sustaining and enhancing the natural grandeur and building local community through wide-ranging educational, cultural and recreational programs. The Esplanade Association collaborates with the Massachusetts Department of Conservation and Recreation to improve the experiences of the riverside green space’s millions of annual visitors, and the widely respected group has been the catalyst for nearly $30 million in park improvements. Several members of Adviser Investments team spent September 6, 2018 contributing to a host of park beautification and maintenance projects. Given the season, our work focused primarily on the much-needed and worthy effort to manage invasive species and weeds, rake leaves and remove litter. This was our first opportunity to put muscles to work to support The Esplanade Association’s worthy cause, and we look forward to next year! To learn more about The Esplanade Association visit their website.